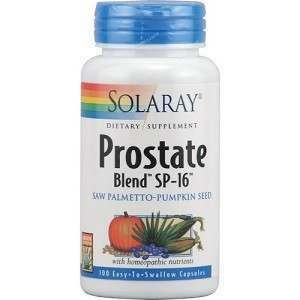 Every bottle of Solaray SP-16 Prostate Blend offers 100 capsules of dietary supplement goodness made to deal with your prostate issues. This is also one of the most affordable product supplements around, with the Better Health Store in particular listing it as around $10-$11 without the discount (and more than $6 with the 40% discount). Although herbal and natural supplements aren’t clinically proven or recognized by the FDA like drugs to diagnose, treat, prevent, or cure prostate issues, they’re still recognized as vitamins and nutrients that could assist the issue. At any rate, according to the Better Health Store, they guarantee the best value, quality, and service when distributing SolaraySP-16 Prostate Blend by having a 30-day money back guarantee. You can send the empty bottle or a bottle with unused portions back to them with the copy of the invoice for a full refund within 30 days of the date of purchase. Jacob Johnston	reviewed Solaray SP-16 PROSTATE BLEND	on May 6th	 and gave it a rating of 3.